Almost all dogs are better suited for the cold than humans – it’s just the way they’ve evolved. However, some breeds are better suited for the cold, rain, snow and ice than others. These breeds historically served a purpose that had to do with cold, nasty weather, climates or conditions. Three breed groups feature several dogs that tend to fall into the winter-loving category and have some unique features that help them adapt to cold climates – namely double coats (those featuring an insulating under layer and weather-resistant outer layer) that were developed to repel the elements. It’s something to keep in mind if you’re considering a new dog. These dogs tend to be happy and at home in colder temperatures, and if you live a hot area (like the desert southwest) they might not fare as well as in more northern climes or higher elevations where cooler weather is more prevalent. Breeds such as the Labrador, Chesapeake and golden retriever were developed to fetch fishermen’s nets and hunters’ waterfowl from rough, icy seas. As such, retrievers tend to have an outer coat that is slightly oily, which helps repel water while trapping air and body heat while submersed. Their undercoat helps to trap that body heat and to insulate them from the water. If you’ve ever bathed a retriever, you know how difficult it can be to thoroughly rinse one to the skin. Perhaps more than any other breed group, many spitz-type dogs are adapted for cold, arctic climates. Breeds such as the Norwegian elkhound, Akita, Alaskan malamute, Samoyed and Siberian husky thrive in wintry conditions. Their double-insulating coat is typically long and extremely thick. Generally fluffy, the thick fur traps copious amounts of air while repelling snow, ice and wind. Combined with a dog’s ability to internalize heat, spitz dogs stay toasty warm even in harshest of winter climates – their ability to cool themselves however, is equally as impacted so be very careful with them when it’s warm. Many of the large dogs within the working group are perfectly suited for cold, snowy, wet, and wintry conditions. The Bernese mountain dog, Great Pyrenees and Newfoundland breeds are perfect examples. These breeds were, and in many instances still are, used to guard flocks/herds of livestock or in search and rescue. The St. Bernard and Newfoundland are two that developed in the search-and-rescue arena – St. Bernard dogs combed the Swiss Alps for snowbound travelers while the Newfie is still used as a water-rescue dog. 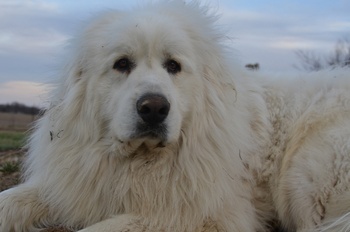 Great Pyrenees and other mountain dogs lived among sheep and other livestock and were used to protect them from predators. Again, their thick, heavy coats retained any ambient body heat while fighting off the elements – rain, sleet, snow or icy seas – to keep them dry and warm no matter the conditions.